This is plate five from HH Wilson's 'The Oriental Portfolio'. Wilson draws from the description by Lieutenant Thomas Bacon who had recently visited the village. 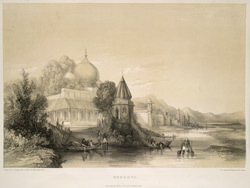 Bacon described the village of Kankhal as "consisting of one broad street extending nearly three quarters of a mile along the bank of the river. The street is perfectly straight and the houses and temples by which it is lined, are seen to great advantage, the projecting balconies and turrets presenting a picturesque variety of architectural ornament and outline. The buildings in themselves are not remarkable for either beauty or magnitude, but there are some handsome temples and ghats or flights of steps by the river side."